Citizen: Hey!! That's my ship!! He stole my fishing ship!! Where is he going!? Citizen: He's raising a black flag!! Is he trying to be a pirate!? This is foolish!! A single child pirate!? Citizen: The World Government ship is arriving soon!! You're in the way of the ceremony!! Hey you!! Hurry up and come back!! Sabo: What scares me the most... is for me to be swallowed up in this city, and being changed..!! I'm not returning!! Magra: What!? Isn't that..... 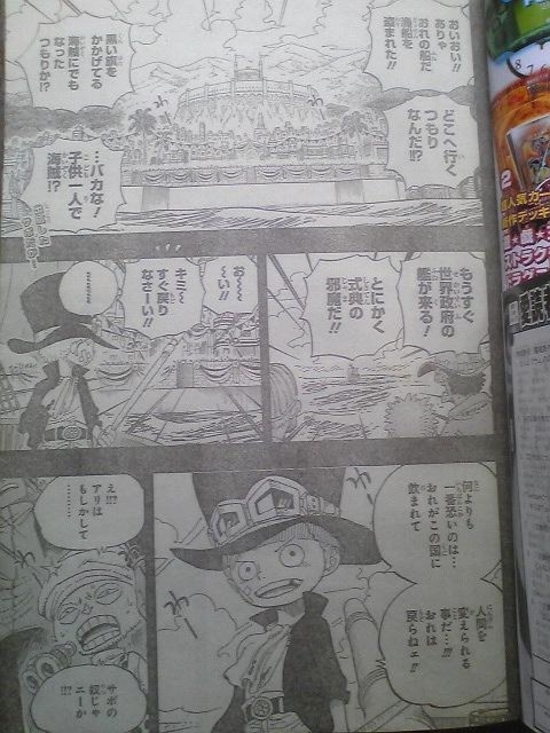 Sabo!? Citizen: The Government ship has arrived!! 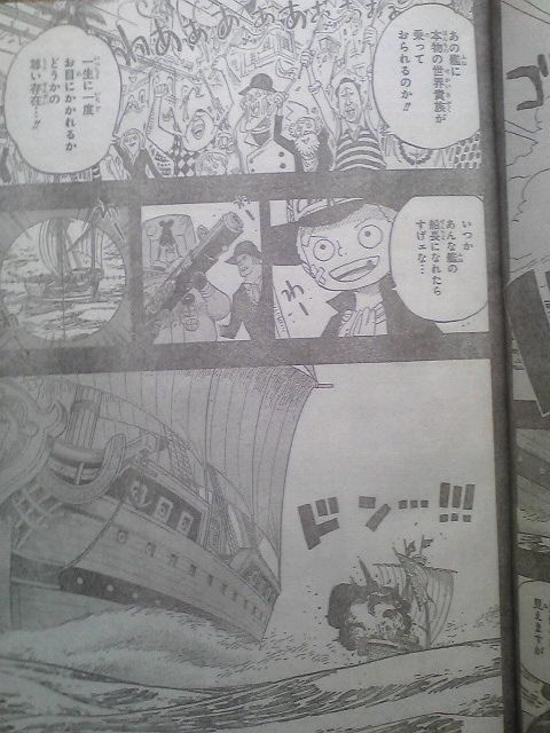 Sabo: ........ wow, it's a huge ship... my ship may be caught in the waves. I should sail away from it. World Noble: ...What is that thing eh? Citizen: So a real World Noble is on that ship!! They are such divine existence, you'd be lucky to see them once in your life time...!! but right now, you're in no shape to be going to the trash mount where the army is roaming about! 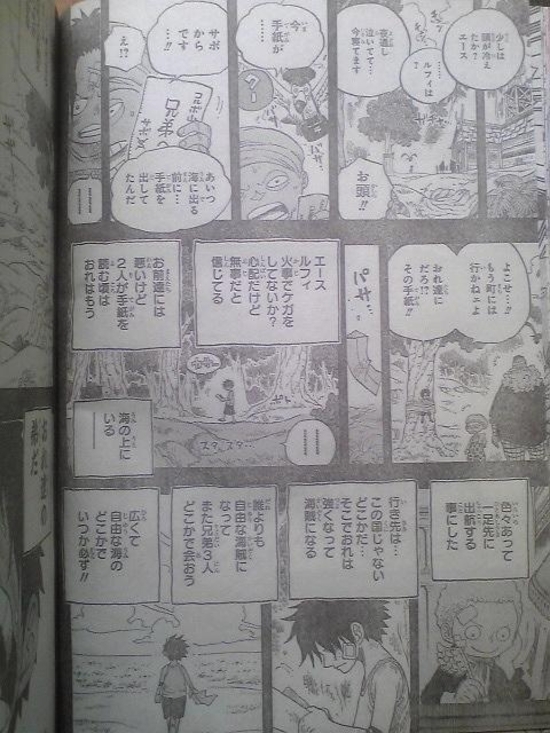 Magra: With a huge fire like that, I know the chances are slim.. but we want to believe boss and Ace are alive as well! Dogra is checking out the Trash mount right now, leave it up to him! 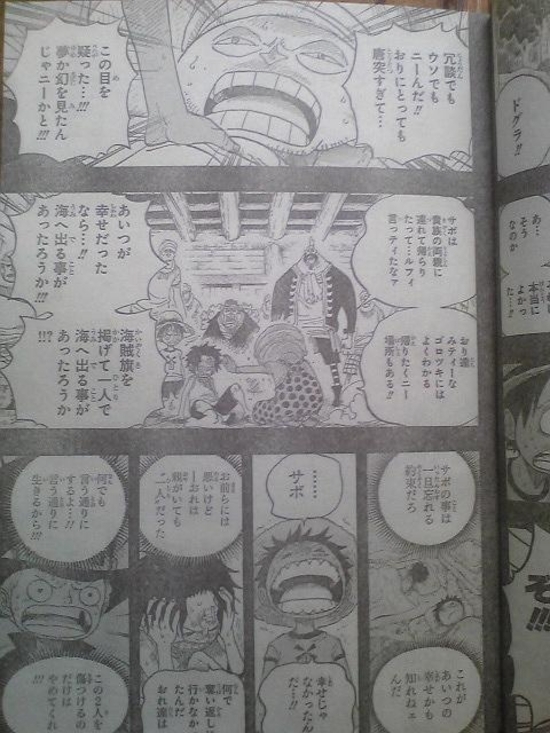 Magra: Listen Luffy, we're all in pain just like you! Citizen: The fishing ship's been fired at! Citizen: Is the child ok!? He must have gotten on the nerves of the World Noble!! Sabo: Damn!! The ship's on fire!! Why did they suddenly fire at me...!? Citizen: Saint Jalmac, there was a child on that ship!! Jalmac: If you raise a pirate flag, you're a pirate no matter who you are... besides, he was a lowly citizen crossing the path of my ship!! Noble: What was that ship about!? Hurry up and clean up the debris!! What if we displease the Celestial Dragon on a important ceremonial day like this!? Bandit: Hey everyone!! They're back!! Luffy & Bandits: Ace!!! Boss!! We're so relieved!! You both made it back safely!! 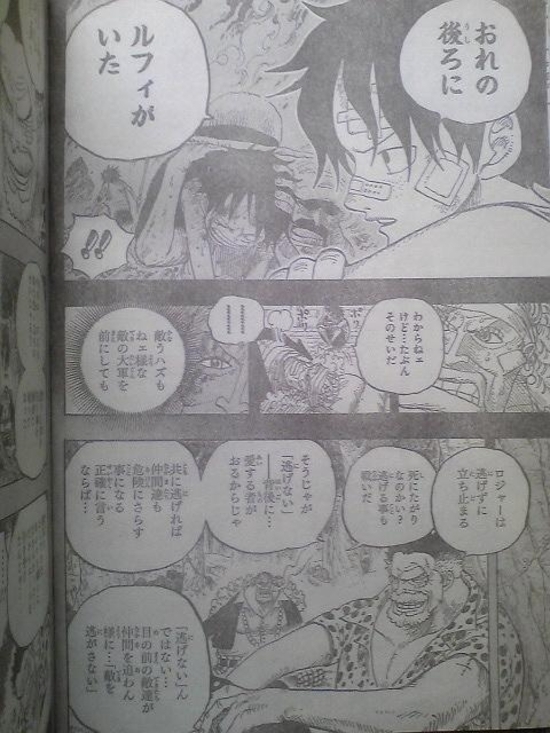 Ace: Luffy, did you think I died? Ace: What are you crying for!? Don't kill me off that easily!! Ace: That night in the fire... we actually won against Bluejam, but by that time the road was all blocked by fire. 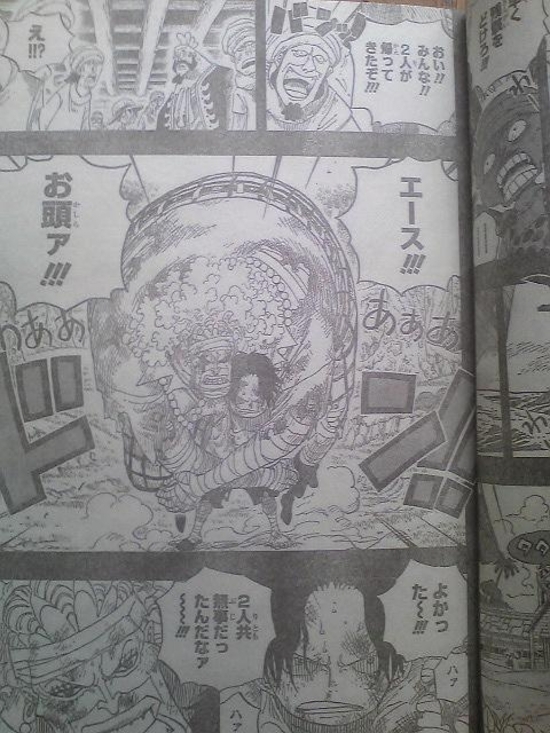 Dadan was burned badly in the fire, so I hid her in the riverside of "Forest of Inbetween", and stole medicine and such from the town to keep her alive. Magra: I see, well I'm glad both of you are alive. 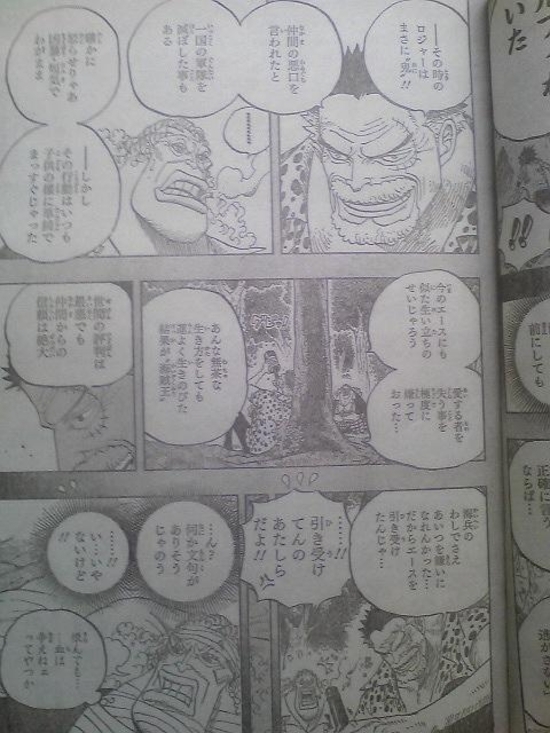 Dadan: Ace... why didn't you run away? Ace flashback: I won't run away!! Garp: Even when facing an army he couldn't possibly defeat, Roger never ran, and stood his place. Garp: That's true, but he still wouldn't run away... as long as there are loved ones behind him. If he run with them, his crew would be in danger as well. To elaborate... it's not "No running away". 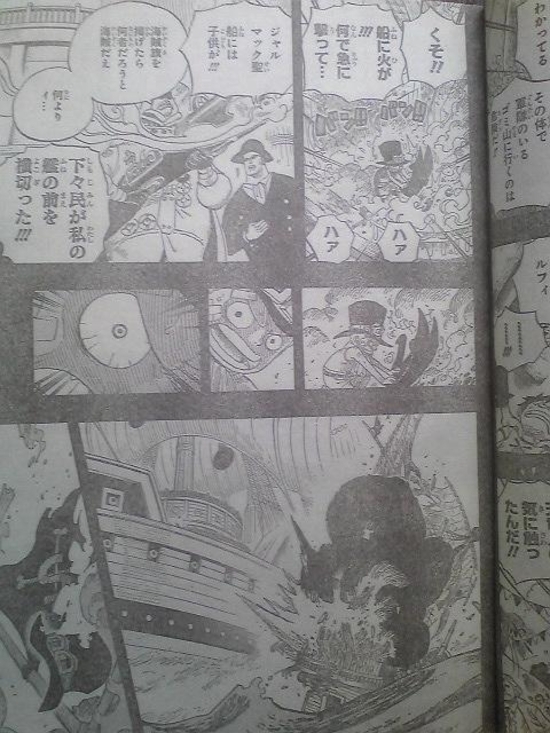 He doesn't "let his enemy go" to prevent them from pursuing his crew. Garp: And Roger at the moment could only be described as "Demon"!! 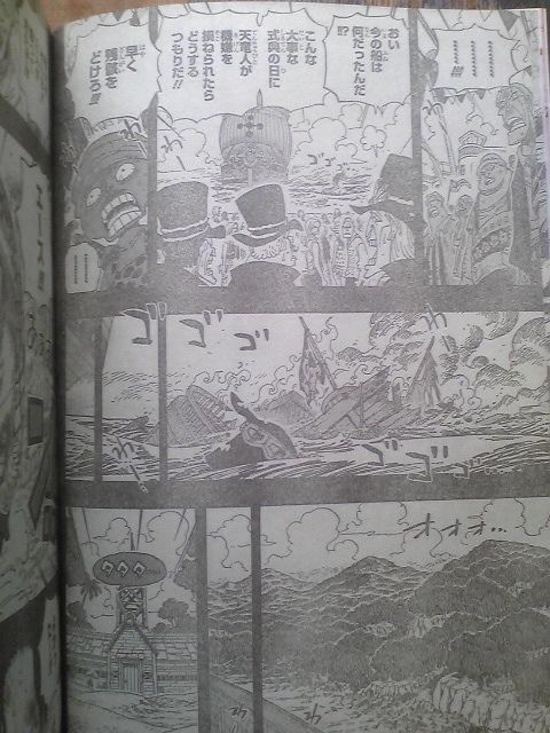 He even destroyed an entire army of a nation because someone spoke badly about his crewmate. Yeah, if you get him angry he would be extremely violent, short tempered, and selfish. But his actions were always as simple and pure as a child. 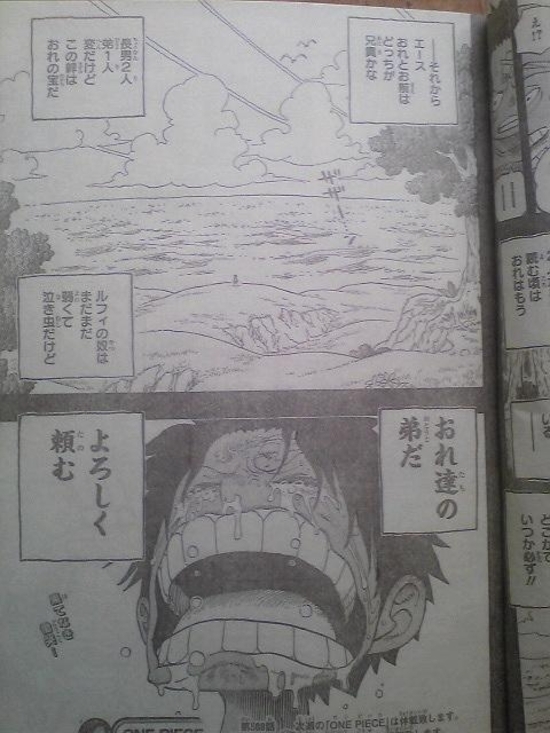 Garp: Probably it's because he was born and raised much like Ace... he feared extremely of losing those he loved. 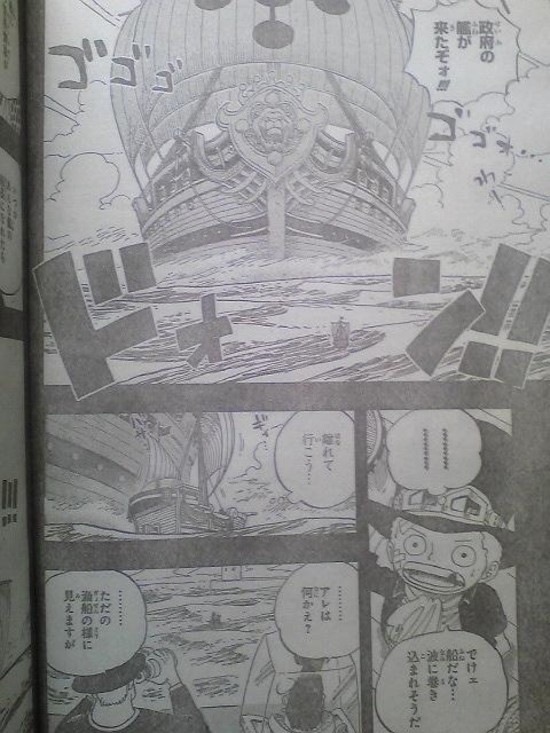 "Pirate King" was the result of him living recklessly like that, yet somehow lucked out and surviving. He may be terribly infamous to the world, but among his crew he gained the utmost trust. Even a marine like me couldn't hate him... that's why I took care of Ace. Dadan: Hell no!! The one being forced to take care of Ace is us!! Garp: What, do you have objection to it? Dadan: ....!! Uh, of course not!! Luffy: Hm? Hey Dogra! You went to look for Ace and Dadan right? They both came back already! Dogra: !! Really? Well that's good...!! Ace: You LIE!! Even if you're joking, I won't forgive you for it!! Dogra: It's not a joke or a lie!! It happened so suddenly... I couldn't believe my eyes!! I thought I was seeing things or dreaming it!! Luffy, you said Sabo was taken back by his noble parents, right? Thugs like us understand that there are some places you never want to go back to!! If he was really happy... would he sailed off to the sea like that!? Would he raise a pirate flag and sail out to the sea all by himself!? Luffy: Sabo.... he wasn't happy at all!!! Ace: Why... why didn't we go take him back!! Sabo flashback: I'll do whatever, and live however you want me to!! So please, don't harm these two!! 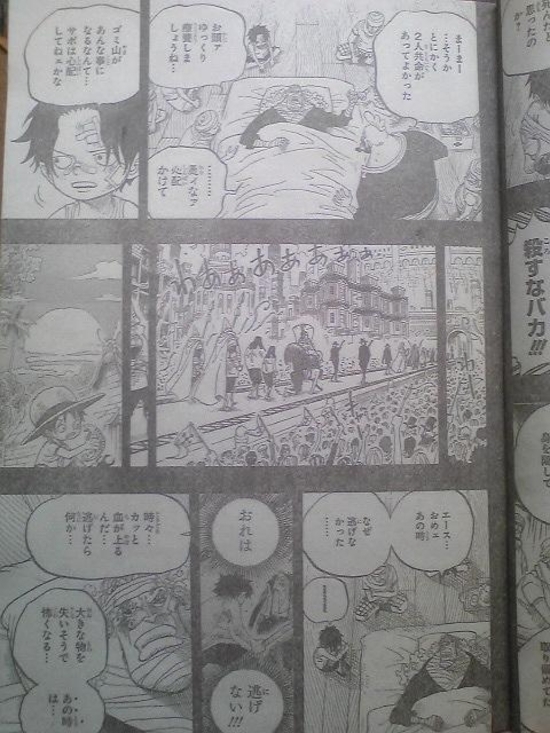 Dadan: This world killed Sabo!! What could you possibly do!!? Your father died and changed the era!! You decide however you want to live and die, AFTER you achieved that level of manliness!!! Dadan: Tie this idiot up!! 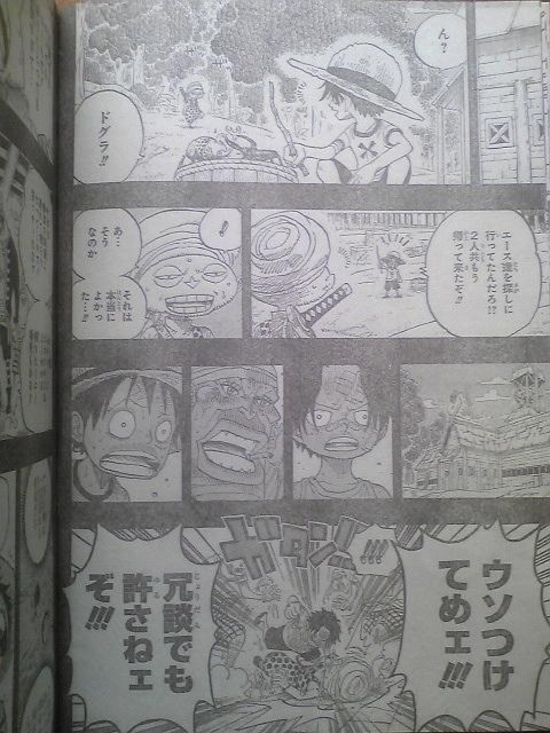 Ace: Shut up Luffy!! You're a man, don't go about crying like that!! Bandit: Have you cooled your head yet, Ace? Bandit: He's been crying through out the night, and sleeping right now. Dogra: Hey boss!! We just recieved a letter! It's from... Sabo!! He left a letter before he set out to the sea!! Ace: Give it to me!! I won't go to the town anymore... that letter was made out to us, right!? 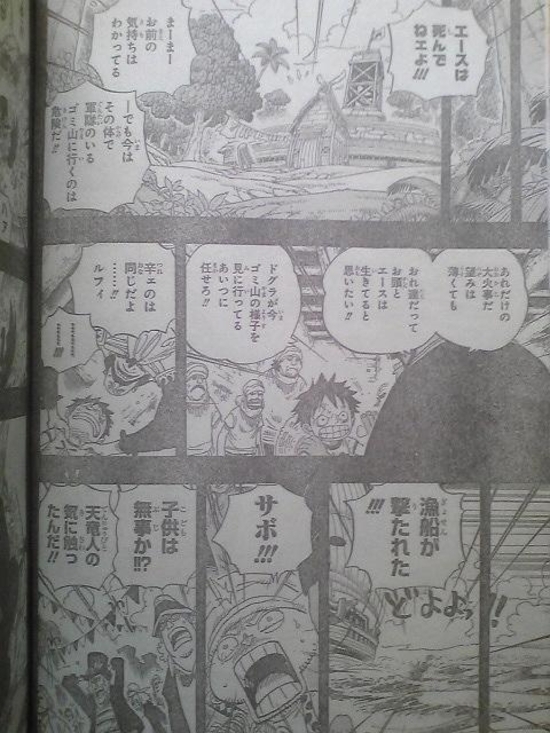 Sabo's letter: Ace, Luffy, are you alright? Were your hurt in the fire? I'm worried about you, but I believe you two are safe. I'm sorry you guys, but by the time you read this letter, I'll already be out in the sea. After much thinking, I decided to go ahead before you guys. The destination is... wherever other than this country. When we all become freer pirates than anyone, we three brothers will meet again somewhere. Out somewhere in this big, free ocean, I promise! Oh, and Ace... you and I, who'se the older brother? Two first brothers and one younger brother... that may sounds strange, but this bond is my treasure. 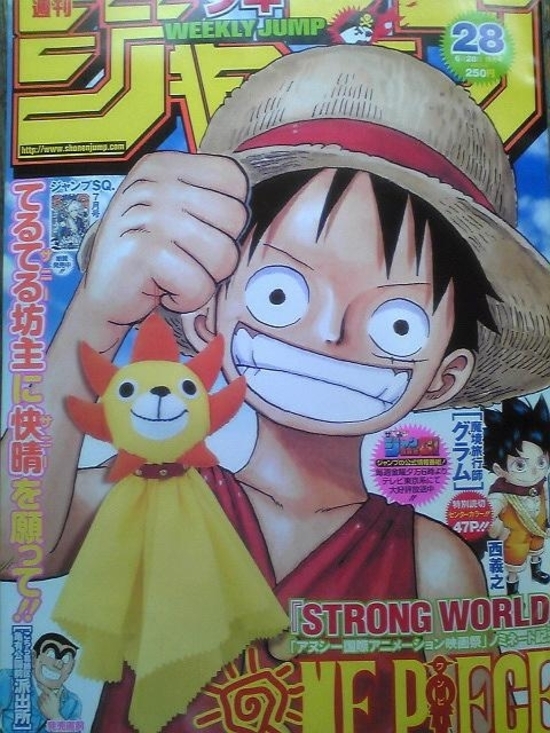 Luffy is still weak and a crybaby, but he's our little brother. Take care of him for me.